Some 80,000 couples succeed in getting married in Las Vegas every year. If this is what you're planning, you will find a great selection of wedding chapels to tie the knot. Choices of where to hold a Las Vegas destination wedding are as plentiful as the styles of ceremony and locations available. Venues for getting married in Las Vegas range from a drive-through on the Las Vegas Strip to chapels presided over by an Elvis impersonator to tasteful, upscale affairs. Discover a variety of venues where Las Vegas weddings are staged, from chapels on the Las Vegas Strip to ones inside casinos, from drive-throughs to helicopters. The first step to make any Las Vegas wedding legal is taking a trip to the Clark County courthouse to buy a marriage license. Las Vegas Marriage Bureau hours are 8 a.m. to midnight, seven days a week. (Valentine's Day is peak time.) The cost of a marriage license in Clark County is $77. Couples like Dana and Yuri, who planned a Bellagio wedding, traveled from the hotel to the Clark County courthouse downtown in style. As part of their Bellagio wedding package, a chauffeured limousine took them to the Las Vegas Marriage Bureau and back to the hotel. 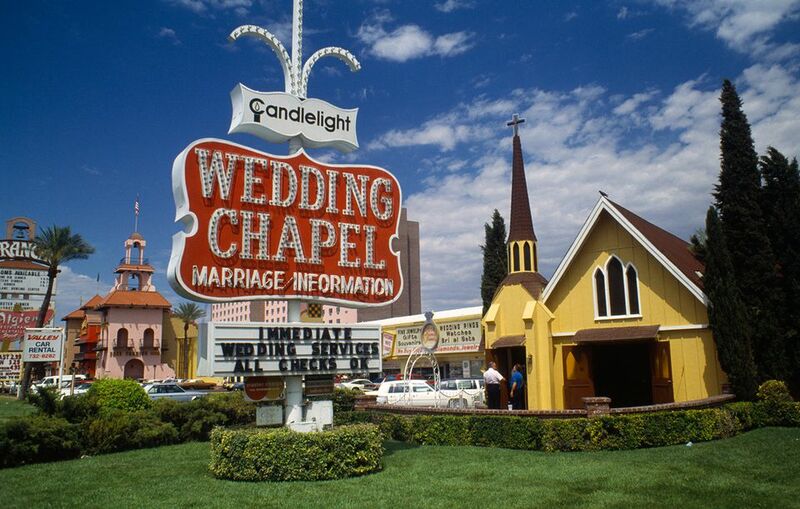 Open 24/7, the Little White Chapel on the Las Vegas Strip is an icon of quickie, no-muss, no-fuss Vegas Weddings. Some couples may feel kind of rushed on this wedding conveyor belt. If you want to tie the knot but have a small budget, avoid upselling on flowers, photography, and other niceties. While you may be able to walk in to the Little White Chapel on the Las Vegas Strip and get married without a reservation, it's advisable to make one in advance. That way, you can guarantee the time, chapel, and package you want for your wedding. Famous Customers: From Frank Sinatra to Britney Spears. Thousands of couples have said their vows at the Elvis Wedding Chapel, where an impersonator of The King doesn't only perform the wedding ceremony — he'll serenade you with a selection of his greatest hits. If you believe a wedding need not be somber and serious, an Elvis-powered ceremony can be a hoot. Note that there is a variety of Elvis wedding packages you may choose from. Elvis-inspired ceremonies are available at several chapels on the Las Vegas Strip including the Graceland Wedding Chapel and the Little White Chapel (pictured). Like most Las Vegas wedding venues, Bellagio offers the services of a wedding coordinator and a choice of wedding packages. Packages range in price depending on the number of amenities a couple chooses and the amount of chapel time reserved. Prices for a Bellagio wedding start at approximately $1,500 and ascend steeply from there. Bellagio features two wedding chapels and an anteroom where guests gather before the ceremony. The chapel can be decorated according to the couple's specifications. Above is the South Chapel, which can accommodate up to 130 guests. The smaller East Chapel holds up to 30 guests. The chuppah (wedding canopy) is traditionally used in Jewish ceremonies. Soon it will be adorned with pink roses to match the bride's bouquet and the groom's boutonniere. Chapel of the Flowers has received accolades from publications as diverse as Bride's and the Las Vegas Review Journal. What sets it apart from its many competing wedding chapels on the Las Vegas Strip? Some fans say that it's one of the prettiest venues among walk-in Strip wedding chapels. Grounds feature a waterfall surrounded by landscaping, a wooden bridge, and a gazebo. Thanks to the webcam at Chapel of the Flowers, a couple's friends and family needn't be in Las Vegas to witness the wedding; they can view it over the Internet. Chapel of the Flowers has also presided over Grand Canyon and Red Rock Canyon weddings, military weddings, Elvis weddings, and weddings overlooking Lake Las Vegas. Wedding planners at this Las Vegas chapel can help to arrange receptions and honeymoons in town. Part of Little White Chapel on the Las Vegas Strip, the Tunnel of Love Drive-Through Wedding Chapel was originally created to make it easier for individuals who have difficulty walking to get married. Today both ambulatory and disabled couples alike opt for the fun and novelty of getting married at the drive-through. In 2005, rates for drive thru weddings started at $40 (for couples who supply their own car) to and went up to $150 for a wedding package that included ceremony, photography, a long-stemmed rose, and a courtesy limo. The drive-through wedding chapel also offers rates for bikers and motorcyclists. All participants travel through the Tunnel of Vows, which resembles an underground garage whose ceiling has been painted with cherubs and starlights. As wild as it may sound to have a helicopter wedding over Las Vegas, it's not really practical. First, a helicopter is incredibly noisy, so it's unlikely you could hear each other or the officiant. Second, a helicopter is small, so if you have witnesses they might not all fit (or love to fly). Third, some people get a bit... queasy in a helicopter. For those reasons, most helicopter weddings first take place on the ground in Las Vegas, and are then followed by a helicopter flightseeing tour. A post-wedding helicopter tour over the dramatic Southwest scenery makes a loving couple not only feel as if they are on Cloud 9 but puts them right up there with the clouds. Get Married in Las Vegas? It's a Good Bet! Is a Las Vegas Wedding Right for You?